1. arrest of the escape of blood by either natural means (clot formation or vessel spasm) or artificial means (compression or ligation). 2. interruption of blood flow to a part. Hemostasis. From Polaski and Tatro, 1996. (hē'mō-stā'sis, hē-mos'tă-sis), Although the principal stress correctly falls on the second syllable in this word, the pronunciation hemosta'sis is more usual in the U.S. Do not confuse this word with homeostasis. 1. The arrest of bleeding. 2. The arrest of circulation in a part. 1. the arrest of bleeding by the physiological properties of vasoconstriction and coagulation or by surgical means. 2. interruption of blood flow through any vessel or to any anatomical area. 1. The stoppage of bleeding or hemorrhage. 2. The stoppage of blood flow through a blood vessel or body part. 1 the process of maintaining the blood in a fluid state within the confines of the circulatory system. 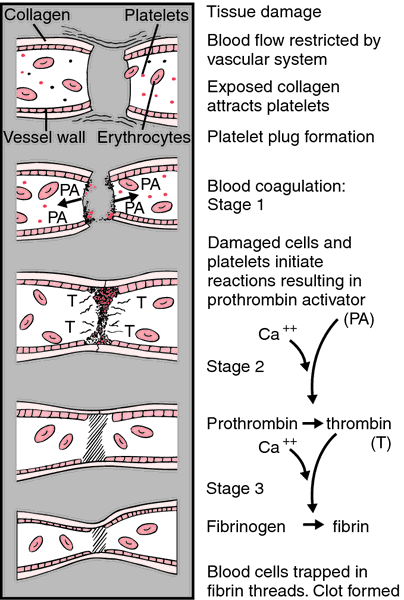 A complex interaction of processes consisting of vasoconstriction, platelet aggregation, thrombin and fibrin generation, coagulation regulation, and fibrinolysis. Also spelled haemostasis. Compare blood clotting. See also platelet, thrombus, vasoconstriction. 2 the arrest of the escape of blood by compression or ligation. Internal medicine Any natural or interventional stopping of blood flow. See Injection sclerotherapy. The stopping of bleeding or blood flow through a blood vessel or organ. 2. Arrest of circulation in a part. n the arrest of an escape of blood. arrest of the escape of blood by either natural (clot formation or vessel spasm) or artificial (compression or ligation) means, or the interruption of blood flow to a part, or the artificial stimulation of clotting, e.g. electrocautery, topical collagen. direct pressure applied with sponges to low-pressure bleeding points.